Magnolia Hearth Hand Cake Stand Glass Covered Wooden Farmhouse Kitchen Table Decor by Hearth and Hand at Stone Ridge Communities. MPN: unknown. Hurry! Limited time offer. Offer valid only while supplies last. 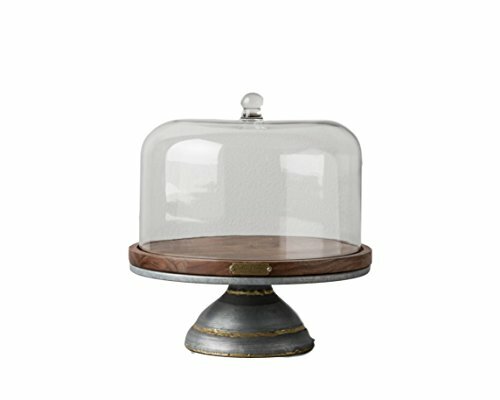 Keep your cakes, pies, cupcakes, and other freshly baked treats beautifully displayed in this rustic, glass domed cake stand. The cake stand has a natural wood base with galvanized metal, raw welding accents for a simple, stylish look that works perfectly with modern farmhouse home decor. The thick, elegantly shaped glass lid fits snugly into a groove on the wooden base, and features a knob on top for easy lifting. The Magnolia Hearth and Hand brand was created in collaboration with celebrity remodelers Chip and Joanna Gaines. This cake stand was designed to reveal the beauty of everyday moments shared with family and friends. Overall Dimensions: 12.35 inches (H) x 11.5 inches (W) x 11.5 inches (D). If you have any questions about this product by Hearth and Hand, contact us by completing and submitting the form below. If you are looking for a specif part number, please include it with your message.